Based on the successful 2002 London play The Talking Cure that starred Ralph Fiennes, The Dangerous Method is set on the eve of the World War I, and follows the turbulent relationships between fledgling psychiatrist Carl Jung, his mentor Sigmund Freud, and Sabina Spielrein, the troubled but beautiful young woman who comes between them. Speculations were made as to how close the patient/doctor relationship was or whether they had crossed a forbidden boundary all together. Speilrein went onto become a psycholigist herself and theories by both Jung and Freud can be connected back to Speilrein`s findings. 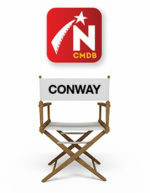 The screenplay was adapted by The Talking Cure`s playwright, Academy Award-winning writer Christopher Hampton. The play itself was based on the 1993 non-fiction book by John Kerr, A Most Dangerous Method. 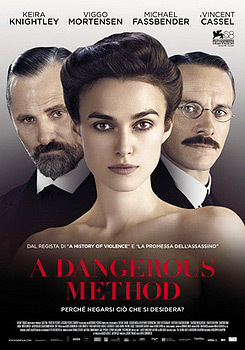 A Dangerous Method had its world premiere at the 2011 Venice Film Festival and its North American premiere at the 2011 Toronto International Film Festival. Trailer & Poster courtesy of eOne Films. Northernstars reviews A Dangerous Method.